Mrs. Cote is a well-respected nurse and martial artist. In 2013, she was awarded Nurse of the Year at Good Shepherd Hospital for her volunteerism. She has a second degree black belt in Shotokan karate and is a student of the Israeli martial art known as Krav Maga. 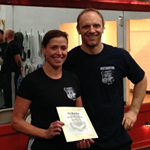 In 2014, Mrs. Cote became a certified Level 1 instructor of Krav Maga Force. As the mother of a special needs daughter, Mrs. Cote brings particular skills to help special needs children who often are targeted by predators. Mrs. Cote will be advising Green Tara Project on curriculum development for high risk individuals where physical confrontation is imminent. 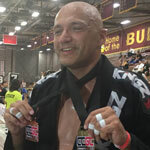 Kurt Lakatos has been a Krav Maga and martial arts instructor for over 25 years. He serves as the Executive Director and Head Instructor for North Beach Combatives, a non-profit organization devoted to teaching self-defense to survivors of violence, returning veterans suffering from PTSD, and others who need this training the most. Kurt has trained in various martial arts over the years, including: Tae Kwon Do, Shorei Ryu, MuayThai, Krav Maga, and more recently Brazilian Jiu Jitsu. Kurt is the founder of Krav Maga – Milwaukee and has held simultaneous certifications from Krav Maga Worldwide and the Israeli Krav Maga Federation. He has had the good fortune to train directly under some of the premier Krav Maga / KAPAP instructors in the world including Eyal Yanilov, Darren Levine, John Whitman, Amir Perets, and Avi Nardia among others. Kurtis also a certified Spikey-Tec instructor for both civilian and law enforcement under Sifu Sapir Tal and is a certified Pankration instructor under the USA Federation of Pankration Athlima. Kurt will assist in skill development and curriculum building for Green Tara Project’s classes, as well as collaborate on class implementation.